I LOVE a beety, gingery juice. But I don't love the cost to purchasing fancy juices, and I don't have a juicer. So I settled for a blended drink! 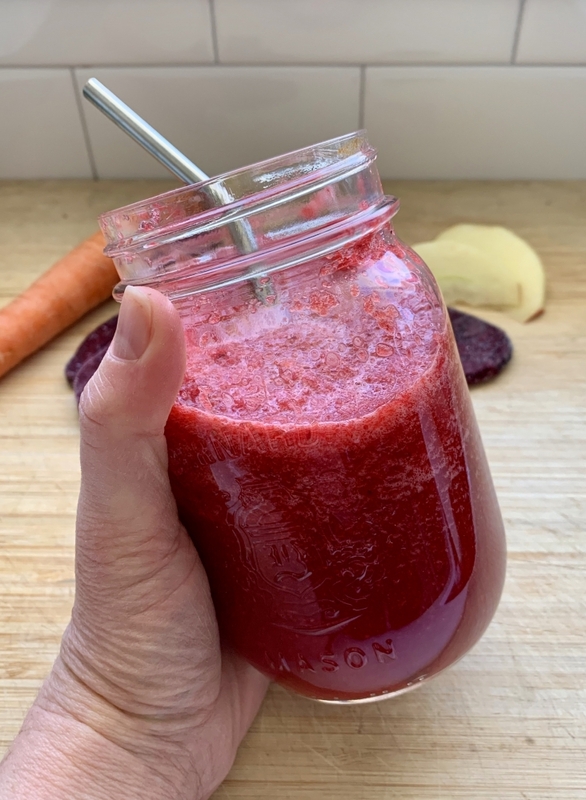 I rarely drink fruit or vegetable juices, but every now and again I crave a cold beet juice with ginger and lemon - spicey, tart and sweet all at the same time. Beets are such a cool root vegetable that not only have a stunning, deep colour (check out this Roasted Beet and Canellini Bean Hummus) but have been getting a lot of attention over the past few years for their effects in the human body. Beets are rich in nitrate (NO3), different than the type of nitrates found in processed/smoked meat. The nitrates in beets are reduced to nitrite (NO2) on the posterior part of the tongue by certain bacteria. Then nitrites are further reduced to nitric oxide (NO) in the stomach. Because of this process, beets improve blood flow have been shown to lower both systolic and diastolic blood pressure. Also, beetroot juice improves muscle contraction and relaxation and some studies show that beetroot juice supplementation may improve cardiorespiratory endurance and sport performance. While I don't have blood pressure issues, nor am I an endurance athlete, nor do I think beet juice will magically improve a person's health or sport performance, I DO think this is interesting information that adds to my curiosity in beets. This blended drink is fresh and colourful and full of a variety of health promoting antioxidant nutrients and non-nutrient compounds. 1) Add all the ingredients to a blender and mix it up really well.